Image caption D Double E: "I've always wanted to give the people my album." As one of grime's pre-eminent MCs, D Double E helped pioneer an entire culture. His roots go back to the era of garage and jungle, when the scene still didn't have a name. Along with the likes of Kano, Stormin and Ghetts, he was part of the Nasty Crew before forming the Newham Generals and signing to Dizzee Rascal's Dirtee Stank label. Skepta has called D Double E the "greatest of all time". Dizzee said he inspired him to start rapping. But his music has largely been confined to mixtapes, one-off singles and high-energy radio sets... Until now. Last Friday, the East Londoner finally released his debut album, named Jackuum after the term he coined meaning to "rewind" or "reload" a track. "Just time ticking is what made it happen," he says. "I'm 37 now. You can't wait forever. I don't want to be having my first album at 40." In the past, he admits, he resisted the urge to go solo out of loyalty to his bandmates. "I was in a team situation, so that was my mindframe," he says. "So if I'd got a big call from Sony or Island Records and they'd wanted to sign me, I would tell them, 'I'm in a group with my people'. "That's why it's taken so long: I'm loyal and I care." 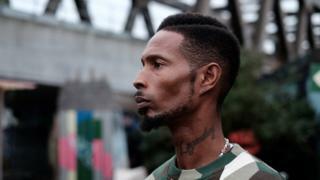 D Double E was born Darren Dixon in Forest Gate, east London, to Jamaican parents. He has 25 half-brothers and sisters ("we've given up on birthday cards - we just turn up if there's a party") but home life was just him, his mother and his one full brother. In his teens, he cut his teeth MCing to drum and bass beats at house parties and quickly graduated to pirate radio. His mum "wasn't really with me on the journey," he admits, and called in some favours to get him off the streets. "So my aunt, she was an accountant in a South Kensington University and my mum spoke to her. The next thing you know she was like, 'You're going to come and work with me for six months.'" Against expectations, he thrived in the job. "I used it to my advantage. I made money, I bought a motorbike. It definitely clued me up, man," he says. But his ambition was undimmed. He'd spend the nights playing raves and trading bars before going back to work. All the while, he was developing a signature style - moderating his rapid-fire delivery to suit the slower tempos of grime, and building an arsenal of absurdist catchphrases (bluku, jackuum, bud-a-bup-bup) that, alongside his East London patois and whip-smart wordplay, made him instantly recognisable. Yet it was Double's bandmates in Nasty Crew who scored successful solo careers during the first wave of grime in the early 2000s. "I was just happy Kano had an album; and I loved the tunes on there," he says. "Even at that point, I wasn't thinking, 'He's got one, so I need one too.'" The crucial difference, he thinks, is that Kano had a manager who encouraged him to strike out on his own. "I never had no-one looking at me like that. People wanted to work with me but no-one was saying, 'Don't go with them. Do you.'" He finally took the plunge in 2014, setting up his own label and releasing scene-stealing tracks like Street Fighter Riddim (sample lyric: "I'm that guy, son / Sucking up MCs like a Dyson"), before starting work on his debut album. A year in the making, Jackuum acts as a portfolio of Double's career to date - opening with a hat-tip to pirate radio, before delivering stark grime beats (Better Than That, Back Then) and a series of dreamy, nostalgic jams (Live Tonight, Lyrical Hypnosis). Skepta even drops in to pay his dues on Nang, an incendiary tour de force where he riffs on D Double E's opening verse - taking the last syllable of every line and using those samples to construct his own rhyme scheme. "It's mad technical," marvels Double. "He listened to the end of my words and he'd add new beginnings. It's magic." The album's already received several four-star reviews - but it comes at an odd time for grime. Six months after Stormzy's triumph at the Brits, the scene appears to have gone quiet, ceding ground to the Afro-beat and dancehall-inspired sounds of Not3s and J Hus. Double, who's seen the genre through several peaks and troughs, seems unfazed. "It's just a timing thing," he says, noting that artists like Stefflon Don, Ms Banks and Ghetts all have new material on the way. What does he make of drill music - the menacing strain of hip-hop that's either the cause or the product of inner-city crime, depending on your point of view? "Drill is serious, innit? And them's serious kids," he says. But the lyrics have left him unimpressed. "With these guys, you don't get the colour out of it. You're just getting darkness. There's ways to approach it, still getting your message off your chest where your personality can be involved. "Like when I done the Jackuum Freestyle it was serious for me, but there's still humour in there." Indeed, humour is a hallmark of his album - whether constructing a diss track out of EastEnders characters ("Dem man come like Ian Beale / Us man move like Grant and Phil") or revealing he used to body-pop while watching Top of the Pops. "I've been holding it down for years!" he laughs. "My signature move had to be the running man. And I could do that thing where you jump in the air then land on your hands, like a handstand, yeah? But then I'd come down like a snake and I'd spin around on my back and I'd flip up on the legs. It's just one surprise from a man who's more down-to-earth and quietly-spoken than you might expect from his musical persona. As he prepares to leave, he notes with disbelief that his face is plastered on a billboard 100 yards away from where we sit. "It's mad," he says. "I'm going to go there in a minute. I want to say a prayer underneath."